Avant-garde is the keyword that unlocks the meaning of the Grande 32 Metri project, which offers yet another demonstration of Azimut design creativity and will make its world debut at the Cannes boat show in early September 2018. The main aim of all avant-garde movements is to stand out from classical art. This same mission, interpreted as the desire to express an innovative vision that breaks away from the past, underpins the new Azimut Grande 32 Metri, with exteriors by Stefano Righini and interiors by Achille Salvagni. The Azimut Grande 32 Metri is forward thinking in every sense, not least because of the multiple unprecedented solutions that establish its right to a prominent position in the world of super yachts, or the advanced naval platform that is packed with technology and combines Carbon Tech with a D2P hull or, finally, the pure design excellence that characterizes Salvagni’s outstandingly distinctive work. Stefano Righini has crafted powerful exterior lines, with stylistic features that sweep towards the stern and trick the eye in a way that hides the important interior volumes offered by the boat. The spacious stern beach club, the lateral garage that can house a five meter tender and a three meter jet ski, the huge full-height glazed surfaces on both sides of the full-beam owner’s suite, and the personality-building vertical bow are the distinctive features Righini has given to the Grande 32 Metri, making it absolutely unique in its category. Inside, the sense of sophisticated softness continues to permeate the constituent features, maintaining a family feeling with the other two Grande units designed by Salvagni the 27 and the 35 metri. His approach continues to eschew pure decoration and focuses instead on spatial composition: fluid surfaces detach from the walls to form an independent system, using spatial elements that flow seamlessly while nevertheless establishing distinct volumes. The settings are at one and the same time welcoming, simple and sophisticated, playing on the harmonious balance of detail and function. The walls embrace and expand, like a succession of negatives and positives that fix and extend space. Polished dark wood surfaces alternate with extensive areas and sections of ceiling featuring light-colored wood varieties: everything is in the contrast. The night zone consists of five double cabins. The large owner’s cabin on the main deck is flooded with natural light, while the other four cabins are on the lower deck, two with twin beds and two with doubles. 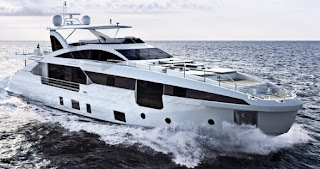 The entire superstructure is built using Carbon Tech and epoxy resin: the combined effect of these materials and the Displacement2Planning hull with double-chine with a wave-piercing bow delivers maximum consumption efficiency levels at both slow cruising speed and higher speeds, extending the yacht’s range. The Azimut Grande 32 Metri will be powered by twin 2200hp MTU units driving the yacht to a top speed of 26 knots.